The bees have been installed from the 6 packages that I purchased last fall. All 60,000 bees and 6 queens, into 4 Warre hives, 1 top bar hive, and 1 horizontal hive. 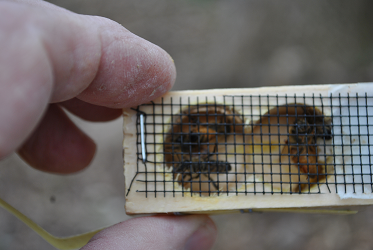 This year’s bee release was difficult to prepare for because I have been working in North Carolina since last July. 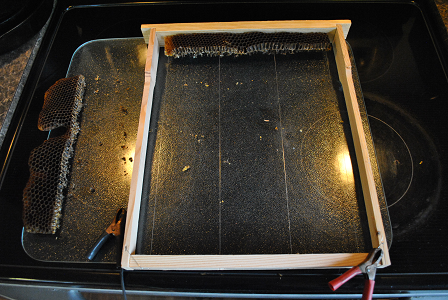 I have had to cut back on some of the things that I really enjoyed doing; the vermiculture and Mason bees. 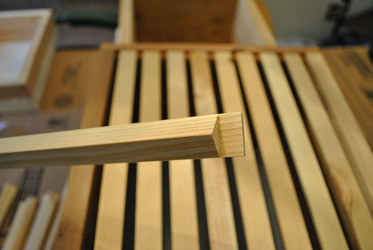 I decided to concentrate on the honey bee this year and to also try out a new hive style, the horizontal hive. As a foot note to last years bee release, none of the hives made it through the winter. I had two hives that became infested with wax moths, one hive didn’t make it and the fourth hive they absconded. One good thing was that I had Warre hives with drawn comb for the bees to work with this year. I was able to distribute empty drawn comb and also some comb that had capped honey. The bees in the top bar hive were not so lucky. 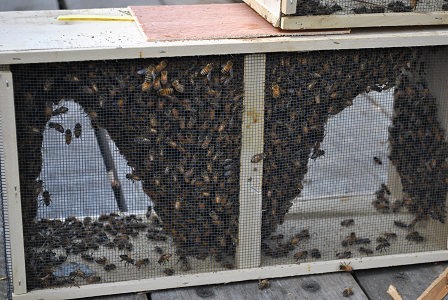 I was able to tie one drawn comb and one comb with capped honey onto two top bars and place a feeder in the bottom. I tied the comb with hemp string. 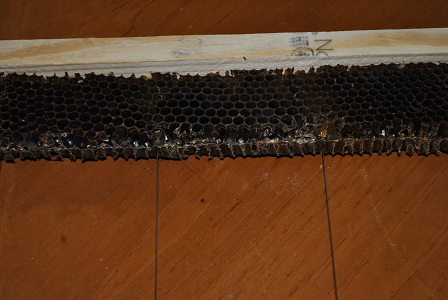 The idea is that the bees will complete the attachment to the bar and chew through the string. I have not tried this before so we shall see how this works out. I could cause the future combs to be built skewed. 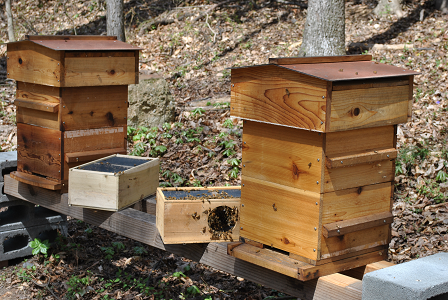 The other hive that I’m trying, that is new to me, is the horizontal hive or the Layens Hive. 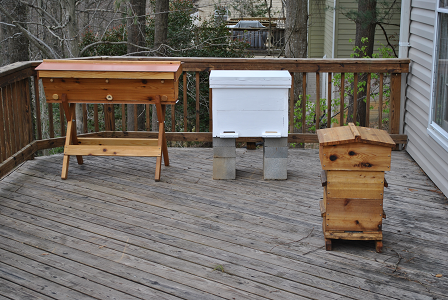 The horizontal hive has frames similar to the Langstroth hives except they are much bigger, by at least 30% and holds 14 frames instead of 8 or 10. This allow for much more area to store honey without having to lift and stack boxes as you do with the Langstroth. This is equivalent to 18 Langstroth deeps and holds up to 45lb of surplus honey. The walls are built from 2”x10” lumber to give extra protection from the climate. This hive can be built to hold from 12 to 30 frames. This gives an extreme amount of versatility to the hive, depending are where it will be used, such as colder climates. I am using frames that are wired but without foundation. I was able to cut spare comb and attach to the wires on the frame by heating them up with a battery charger. It only takes a few seconds for the wires to heat up and then you can push the comb down through the frame to its center and let cool. I was not able to add a feeder so I set a temporary feeder outside the hive, but I did add some bee pollen to the floor of the hive. It turned off cool over the weekend so I wasn’t able to see if the queens had been released yet. I will try to check on them this next weekend. The nice thing about all these hives; Warre, Kenyan Top Bar, and the Layens Hive is that they don’t have to be checked that often. I am hoping that this year will be the year for strong bees. I would like to increase that possibility by changing out the queens to Virginia queens from the Georgia queens, in hopes of having bees better acclimated to this climate. Do not paint or treat the inside of the hive were the bees will reside. Thanks for another great article. I know you stay busy with your work schedule. It is amazing how you find time to help our planet and your readers. I planted three more fruit trees last fall. My neighbors bees and maybe some of your bees, will help pollinate my trees. I think that is great. I know you will enjoy the trees.